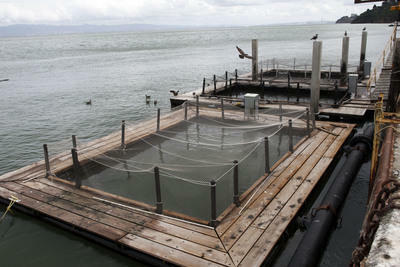 In what may be the largest liberation of animals in U.S. history, nets were cut at a holding pen in the San Francisco bay this week, releasing 40,000 fish into the wild. There has not yet been a claim of responsibility by the Animal Liberation Front or other group. An employee at the institute where the salmon were held says he speculates this may be the act of an animal rights group. The pens were part of a program run by the Tiburon Salmon Institute, in partnership with a pro-fishing student group at nearby Casa Grande High School. According to Tiburon, the fish were being tended to by the students, who intended to release them into the wild themselves later in the month. The website for the Tiburon Salmon Institute would seem to corroborate this story, where they take credit for “releasing over a million salmon into our San Francisco Bay” over the last 30 years. Were the fish going to be released into the wild anyway? There could be a couple of things at work here. The claims that the fish were to be released anyway could be a public relations-oriented lie. Those who cut the nets may not have known the fish were slated to be released in the coming weeks. Or, they could have chosen to risk themselves anyway to give the fish a few extra weeks of freedom, sparing them the psychological suffering of being kept in intense confinement with approximately 40,000 others in a small net. If this was the act of animal liberators, it would be the largest recorded animal liberation ever in the U.S. The largest previous liberation was the Animal Liberation Front raid of the Drewelow and Sons fur farm in New Hampton, Iowa in 2000; where 14,000 mink were released. The Tiburon Salmon Institute is now soliciting funds to purchase security cameras.